A lesser known but no less effective technique is the practice of Gorilla User Testing. The two are often confused because of the similarities in the naming, however, Gorilla User Testing is a much older technique. Donald Norman was a big proponent of Gorilla User Testing during his time at Apple, and it was later perfected by Steve Jobs. Gorilla User Testing is an effective way of testing your UX designs. 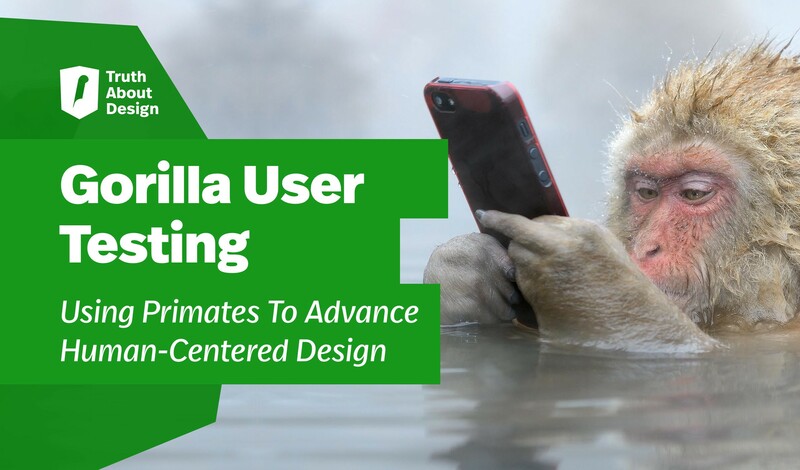 Below we will go into what Gorilla User Testing is, its history, and how to practice it in a modern agile UX environment. 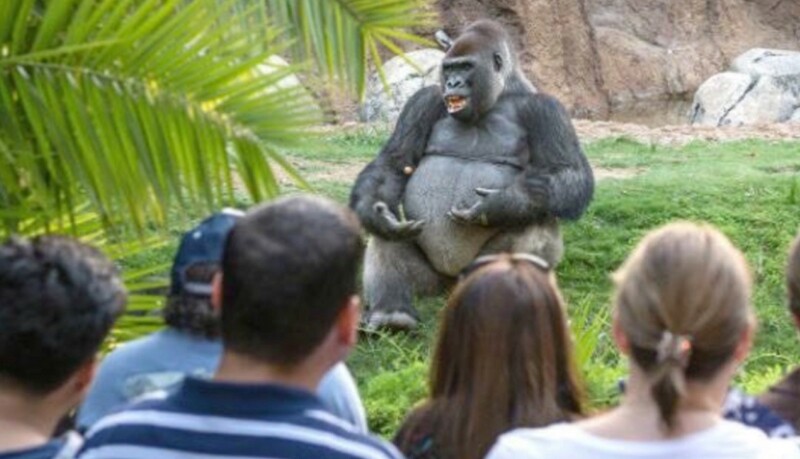 Gorilla User Testing is the practice of using primates to discover latent user needs in humans. This is extremely useful in exposing user needs that humans in modern society have lost awareness of. Primates and humans share up to 99.8% of the same DNA, so it makes perfect sense to use primates for this purpose. 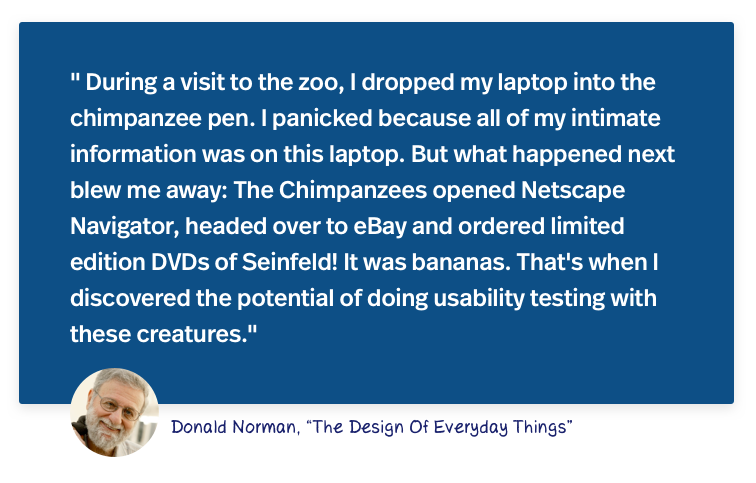 Donald Norman pioneered gorilla user testing in the 1990s. Steve Jobs then adopted and popularized gorilla user testing after his return to Apple. Humans have developed masks to hide their true emotions. You may not get honest feedback on your app because they are too socially conscious to give it to you. Imagine how you’d feel if he responded to your product like this during a user test. Humans are flaky and may cancel last minute or not show up for the user interview. However, you always have access to primates for Gorilla User Testing: just visit your local zoo. Apes have about the same level of intelligence as a person who is multitasking. Most people multi-task. Therefore, by designing with apes, you are simulating a more realistic environment than if you invited human users over into a research lab to have them test your product in an undistracted setting. If it keeps the ape’s attention, you’ve got a winning formula. Humans are apes, too. Apes are people. It’s not fair to exclude our chimpanzee, gorilla, bonobo, and orangutan brothers and sisters from their right to delightful, beautiful, and usable experiences. If it keeps the ape’s attention, you’ve got a winning formula. Conducting a gorilla user test is a straightforward process: Establish dominance, build rapport, make the ask, observe, reward. Continue this process for 5–10 minutes. 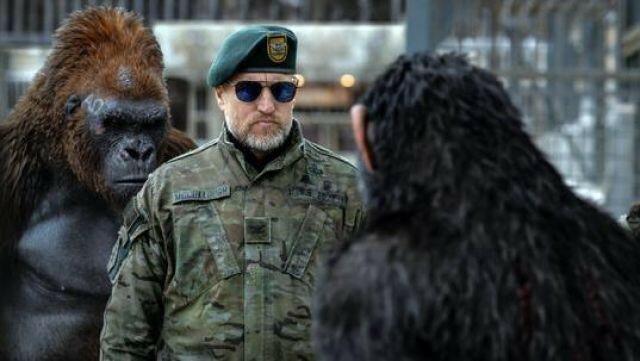 After you’ve dominated the ape and won the battle of wills, it’s time to build rapport. You do this by playing a quick board game with the ape. 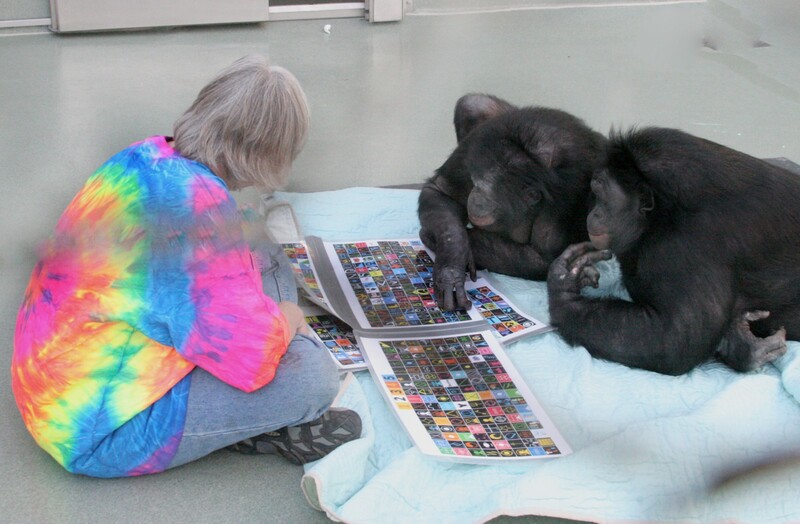 Cards against humanity is the preferred game of choice among great apes. Apes also like memes. A great game for the purpose of introducing memes is called “What Do You Meme”. Play the game for about 10–15 minutes. Make sure to win so you keep your dominant stature. Did you notice whether there was any other way to complete a specific step/task? Can you tell me what you think about these icons? What do you expect to happen if you interact with this icon? Why? On a scale of 1 to 5, where 1 is not at all easy and 5 is very easy, how easy was it to complete the task using the product? It‘s important to not just rely on the ape‘s verbal responses regarding your product. Observe their reactions closely as they interact with your product. You can tell much more from an ape‘s behavior than you can from what the ape says. After the ape has completed the usability test, it’s important to give them a reward. This ensures they stay motivated and are willing to do further tests with you. Be careful with your biases when choosing rewards for the apes. It’s common to think that apes like Bananas, but that is actually a very apeist assumption. We found that most of our test subjects preferred foie gras. Gorilla user testing is an underrated technique that should be in the toolbox of every competent UX Designer. It‘s saved my projects so many times when human test subjects flaked on me, or there were debates with leadership with regards to which human user test result we should listen to. Have you used gorilla user testing in your designs? Do you plan to? Share it with us in the comments.